ARLINGTON, VA.In the waning days of the Virginia governor's race, President Obama made a personal push for Democrat Terry McAuliffe's candidacy by tying his opponent, Republican Attorney General Ken Cuccinelli, to the recent and unpopular government shutdown. "You've seen an extreme faction of the Republican Party that has shown again and and again and again that they're willing to hijack the entire party and the country and the economy and grind progress to an absolute halt if they don't get 100 percent of what they want," Mr. Obama said, pointing to last month's 16-day government shutdown as evidence. The president said the shutdown - which had an outsized effect on Virginia's many federal workers - is not "in the rearview mirror...[Virginia voters] understand that that is not how you govern and that is not how you move America forward." National issues that have sorely divided Democrats and Republicans spilled into the race as Obama rallied for McAuliffe just outside Washington. As Obama tore into Cuccinelli as a compromise-averse ideologue, Cuccinelli was telling his supporters that Tuesday's election will be a referendum on Obama's unpopular health care law and McAuliffe's support for it. "This isn't a game," Mr. Obama told a crowd of 1,600 who were in a high school gymnasium for the event. "There are very real consequences when you operate ideologically, the way some of these folks do." 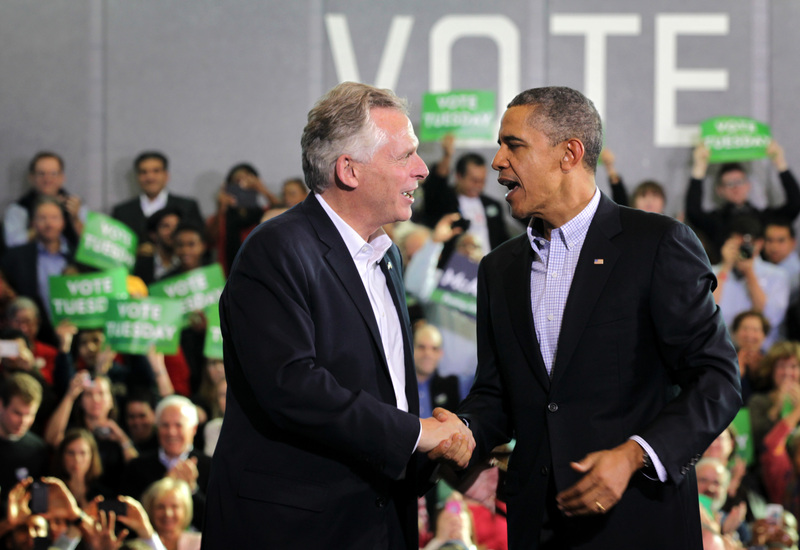 As a contrast, Obama told Virginians that a vote for McAuliffe would be a vote for progress. He said Cuccinelli wanted Virginia voters to forget that Cuccinelli's intellectual counterparts in Congress just weeks earlier had taken the economy, the nation and the economy hostage, hurting Virginians in the process. "This is all about moving forward. It's not about going backwards. It's about building, not destroying. And Virginia, I'm asking you to choose progress," he said. Even before Mr. Obama spoke, Cuccinelli was working to use the campaign stop to energize his own backers, many of whom disapprove of the president and detest his health care law. Portraying McAuliffe as a Washington insider, Cuccinelli told voters in Weyers Cave that a vote for McAuliffe was a vote in support of Obama's health care law. "No more Obamacare in Virginia. That's the message we can send," Cuccinelli said as he began a day that was taking him from airport to airport to rally supporters across the state. Mr. Obama's pitch for McAuliffe constituted a last-minute push by the White House and prominent Democrats to close the deal in the race's final days. McAuliffe, the former Democratic National Committee chairman, has had help from former President Bill Clinton and former Secretary of State Hillary Rodham Clinton. Vice President Joe Biden was to do his part Monday, and first lady Michelle Obama lent her voice to radio ads backing Cuccinelli. Cuccinelli campaigned Saturday with Republican National Committee chairman Reince Priebus. Sen. Marco Rubio of Florida was joining him in the final days. "If mainstream Virginians from both parties don't turn out to vote, you're letting the tea party decide Virginia's future," McAuliffe said. Polls show McAuliffe ahead and campaign finance reports show a dramatically lopsided dynamic, with the Democrats far outraising and outspending Cuccinelli and his allies. Television airtime was tilted in McAuliffe's favor by a 10-to-1 margin. More than 114,000 Virginians have already voted early. Democrats say more registered Democrats have cast early ballots than Republicans. Mr. Obama won Virginia last year by just three points, racking up big margins in the Democrat-rich Washington suburbs where he campaigned Sunday, but carrying far fewer votes in the more conservative, southern parts of the state that have been a focus for Cuccinelli. One year later, Mr. Obama and Democrats are struggling with a health care rollout that's turned into a political fiasco, and hope a McAuliffe victory will allow them to retrench on solid footing. Democrats see Virginia as a bellwether for other competitive states and are eager for a win there to show their approach to governing is resonating with voters ahead of the 2014 midterm elections. That's especially true when it comes to the recent fiscal crisis, in which House Republicans refused to approve government funding unless Obama agreed to debilitating changes to "Obamacare." Democrats emerged politically strengthened from the debacle and are looking to Virginia to see whether that advantage will translate into real gains in elections. Turning to his tea party base, Cuccinelli kept up an intense focus on the health care law, knocking McAuliffe for wanting to use the law to expand Medicaid and add 400,000 Virginians to the program. McAuliffe says the program keeps Virginia tax dollars at home, but Cuccinelli says it will be a drag on the state budget and tie future governors' hands. "Once you get in, there's no getting out," Cuccinelli said. "It's like Hotel California." Cuccinelli said it underscored McAuliffe's overall approach to the campaign. "I think my opponent is running as head lobbyist to lobby for goodies from Washington," he said. "Let's keep Terry McAuliffe's D.C. politics on the other side of the Potomac." Obama has been aggressively fundraising for Democrats, but has sought to limit the chance for blowback by minimizing risk. He and Biden didn't announce events for McAuliffe until after it was clear the Democrat was far ahead in the polls; the same was true with New York mayoral candidate Bill de Blasio. In New Jersey, this year's only other gubernatorial race, the Democrat is far down in the polls and Mr. Obama isn't offering any assistance.